Today is Aug. 3, 2018. I turn 30 and while I’m taking another step in life, that’s not what I’m thinking about. Instead, I’m focused on this week as a whole. You see, at some point this week I was supposed to become a father for the first time. Now I know what some of you are thinking. What in the world does this have to do with hockey? If you give me a few minutes of your time, I promise I will get to that. You see, athletes these days have Twitter and the Players’ Tribune to share their stories. They have the following, the support and the outlets to help deal with any curveballs that might be thrown in their direction. So often, we talk about individual accomplishments and failures as well as teams and how they can make or break select players – they are the support systems that players and coaches have around them throughout the season. And often they play an important role in molding players throughout their careers. So far, I’ve had the opportunity to accomplish a number of things in both my personal and professional life. I’ve had the opportunity to work at Hockey Night in Canada, to help in CBC’s coverage of the 2014 Winter Olympics and went on to get married and take each step in life as it comes my way. But being a father was something I always wanted. Having someone look up to me, depend on me and watch them grow every single day. Never did I think I’d be hurt by that feeling before I even got to experience it. On Nov. 26, 2017, my wife (the captain of my team) came to see me as I was going down for an afternoon nap following an early morning shift at work. In her hand was a positive pregnancy test. I don’t think I’ve jumped out of my seat that fast in years – but I couldn’t contain the ecstasy that was flowing through my body at that moment. 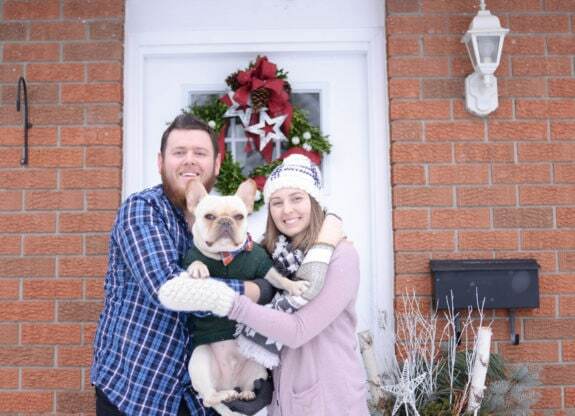 We took the weekly pictures, tried to figure out a way that we were going to tell our parents and siblings (more members of my team) and all the while I began to feel the nerves – the excitement – all of the feelings you get when you’re about to be a father. Still, I wasn’t ready for what came next. Fast forward. We’re 12 weeks into the pregnancy. Our parents know thanks to some subtle photos and grandparent mugs handed out on Christmas. My wife calls me from work and something’s wrong. In all the sports I played, in all the moments in my life, this was the most devastating loss. I must have been in shock or just unsure how I was supposed to react – be strong or let the pain in – but it didn’t strike right away. I’ve had my moments over the past five months – I usually cry alone – but I still don’t think I’ve fully recovered from the loss. Even as I write this, tears are filling my eyes because I just can’t let go. I’ve had moments of disparity. Heck, there are days where I’ve probably gone a little overboard with an extra beer without actually knowing what’s pushing me to that limit. To be honest, I don’t think those around me know just how much it hurt – how dark life got for a while afterwards. I’m not the best at expressing those types of feelings – instead it comes out in anger or aggression – and I look to fight rather than talk. But things got dark very quickly. That is until I realized that we weren’t actually alone in this. 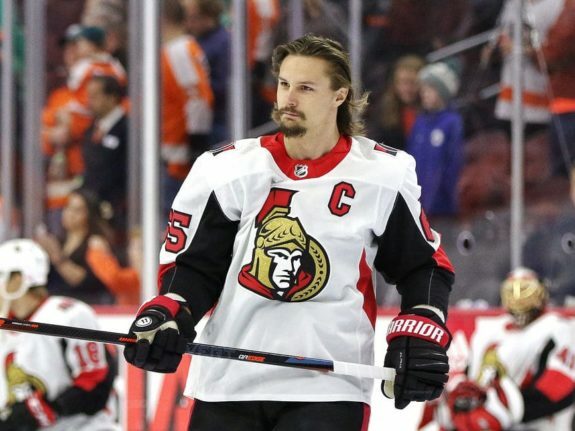 In fact, I was reminded that not long after, Ottawa Senators’ star Erik Karlsson and his wife, Melinda, went through a terrible loss of their own. It started with my wife. Anyone who could go through what she did and come out on the other side deserves to carry my team. She would hold me in those moments that I couldn’t be strong anymore and she would let me know that it was okay to feel helpless and hurt. She shared our story both artistically in a tattoo to remember the baby and in a post on Instagram that got some traction for how brave she was for talking about it. My family – both immediate and in-laws – did everything they could. While some tossed out the cliche that we’ll get pregnant again – not knowing how much that didn’t help – there was always a quick text or reminder that they were there for us. Even on Mother’s Day and Father’s Day my sister would send us both a quick message letting us know she was thinking of us. Our friends – while they couldn’t exactly understand – did their best to try to help us move past it. Remember it, but help us to think positively about the days that are coming instead of remembering the days we had been through. For me, someone who didn’t want to talk a lot about it because of the emotion it always churned, turned to my colleagues at The Hockey Writers. While it wasn’t a topic of discussion, hockey was, it was my escape to another world where I could get away and cover the game I love for just a few hours. I’m sharing this not to find sympathy in what I will be thinking about this week, but rather to hopefully let someone else going through the same situation know that there are brighter days ahead. Focus on the family and teammates you have around you and use them as a crutch even in the darkest of days. I still have days, or moments, that are tough to get past. We don’t know whether we were having a boy or a girl. We never got to hold him in our arms, kiss his head or teach him about the game of hockey – the one I love so much. Today I was supposed to be a father – it should’ve been the greatest birthday of my life. While it won’t be the greatest, it also won’t be the worst because today I’m part of a team that I can rely on to carry me through the shadows of tomorrow.